Birds that winter with us in Michigan are not fat but fluffy. Perching birds must maintain a healthy weight to fly away quickly. But when chilly November winds blow in you'll see birds at the feeders "fluffed up" to trap air between their feathers and bodies to create a natural layer of insulation and act as a buffer from the winds and wet; think downy coat. They also can grow twice as many feathers but they still have to shiver almost constantly to increase their body temperature in cold weather. Birds use energy at high rates. In order to maintain their body temperatures, small species of birds, such as American Goldfinches must eat continuously during short daylight hours to stoke their metabolic fires. If they do not, they will not reserve enough energy to see them through the long night. This is the time when a lot of high fat foods become more critical in a bird’s diet. Every night up to three-quarters of a bird’s fat reserves are used up; reserves that must be replenished the next day. Keeping your feeders filled with high energy, high fat foods can provide your birds with the vital nutrition they need to survive. High on the list of best choices for finches are high fat seeds like sunflower seeds (429 fat calories per 100 grams) and nyjer seed (342 fat calories). 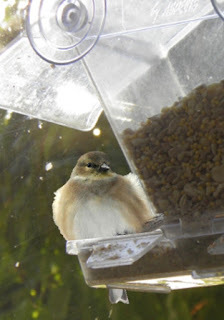 Other bug eating birds birds like chickadees may prefer suet and certain seeds like peanuts, which provide 412 fat calories per 100 grams.